Housed where the original brewery operated, you can't help but be enchanted with the Lion Brewery Restaurant's original stone walls and floor, as well as the unique caverns. Enjoy excellent food paired with a selection of craft beers which are brewed on premises. 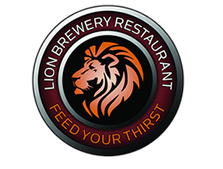 Experience the Lion Brewery Restaurant with seating for 200, open concept kitchen and space for private functions in the grains room and the Cavern Wine Celler. We offer classic cuisine and 10 hand crafted brews made on premise. The Lion Brewery Restaurant first opened in 1986 as a small deli kitchen - soups, salads and sandwiches. Since then we have completed a couple of major restorations, including the excavation of the buried malted grains room and the Cavern Wine cellar. The Lion Brewery Restaurant features a 37' long wooden bar and a cozy fireplace, flagstone floors, and a rich view of the past. Not only are the original walls of Christopher Huethers own brewery visible, the restaurant also features memorabilia highlighting the history of the brewing industry. The main area of the Lion Brewery restaurant, with seating for 100, has low ceilings, stone floors and walls and is completed with crafted woodwork and trim. Our open concept kitchen provides a visual experience to enjoy our chefs creating classic cuisine made with quality and fresh ingredients for our guests to enjoy. The grains room seats 64 people for dining, including private functions. The Lion Brewery Restaurant also showcases the newly renovated cavern, a space which historically was used to age the beer that was brewed in the late 1800's. It now seats 40 people and also can be used for private functions. Come and enjoy a meal, and relax with friends while sipping on one of our 10 hand crafted brews made on premise, made from all natural quality ingrediance. Also serving Imports Beers, such as Heineken, Corona, Becks, Stella and a variety of coolers. 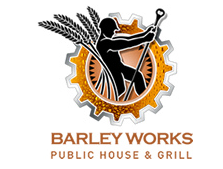 The Barley Works is a restaurant bar featuring a 40' bar, and plenty of screens to enjoy the game. Upstairs is the perfect space, overlooking the room below, for hosting private functions. Come relax and enjoy on of our fine-crafted brews. The Barley Works is a blend of contemporary and the history of the 170 year old building. The main floor restaurant bar has a 40' leather like granite bar top, trimmed out in a stained wood and stainless steal edging. There is beautiful stained hardwood flooring throughout both levels of the restaurant bar. Throughout the restaurant bar you will find flat screen TV's that always have a sporting events on. There are two large projection screens which features the main event -- we show all sports. Upstairs you will find our upper balcony, with a total of a 100 seats in two separate areas that can be booked for private functions. These areas have large flat screens for your private use. The Lion Brewery Mug Club features a wall of hooks for the mug club members to hang there personalized ceramic mugs. From our specialty eggs benedict to start your day, a snack in the middle of the day or a cup of Seattle's Best any time of the day... enjoy a meal or just a quick break at café 1842. 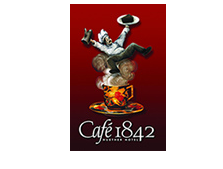 Café 1842 is located in the lobby of the Huether Hotel. The décor features old brick and arch ways that have been exposed and sandblasted to perfection. Old tin ceilings have been exposed and restored. Teraso (marble) floors have been restored and polished back to there original state. Sit by the fireplace while enjoying one of our hot specialty drinks. We serve Seattle's best coffee which is a coffee second to none - bold, smooth with no after taste. Seattle's Best is the largest wholesaler of coffee in the world. We also have a variety of cappuccinos, latte's and specialty flavoured hot drinks. Our kitchens specialize in eggs benedict, serving six different varieties. You can also get your old straight up eggs and bacon, home fries and a couple pieces of your favorite toast. For something light, fresh baked goods from muffins and scones, fresh made cheese cakes and squares. We offer a variety of fresh fruit Smoothies, low fat yogurt and a choice apple, pineapple or orange juices. Gift cards are available to use and to reload for every day use. 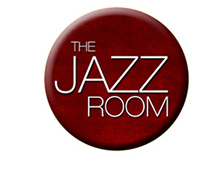 The Jazz Room is a sizzling night club dedicated to the best in jazz music presentation. Home to the Grand River Jazz Society (GRJS), the club has a dual mandateto support exceptional musicians from our own community, and to invite talent from elsewhere for local audiences to hear. The Jazz Room is located in the main floor dinning lounge adjacent to the lobby and Café 1842; just follow sound of the grand piano, sax or classic sound of a trumpet. We offer a full food and bar menu for eating and sipping on your favorite scotch or glass of wine. Doors open for dining at 7 pm. Listen to some light jazz during dinner before the main show at 8:30PM. Tickets can be purchased in advances from the Lion Brewery Restaurant during regular business hours. This room is one of the oldest in the Hotel; when John Adlys purchased the Hotel in 1953, a 7 oz glass of beer was only 5 cents -- he had to sell 40 beers to have $2.00 in sales. There is dark stained oak panel throughout, tin ceilings, and a beautiful oak bar that is accented with stained glass back lit panels; restored Teraso floors are also a nice feature in this room. A custom stage was engineered to support a full size black grand piano which is a permanent fixture. Every Friday and Saturday evening there are live Jazz entertainers playing to a sold out crowd most weekends. Friday evening local jazz entertainers take the stage, the quality is outstanding. On Saturday evenings entertainers are brought in from Vancouver, Toronto and New York City. You can view The Jazz Room website to see a Calendar of Events. Doors open at 7PM for dining.